GrayMatter's podcast featuring one-on-one discussions with digital transformation leaders, culture change experts and operational technology specialists. GrayMatter co-founder Carson Drake dives into the evolution of Industry 4.0 and the company he co-founded in the early 1990s; and Illinois Technology Association CEO Julia Kanouse discusses how Chicago is growing as a tech industry leader. Jeremy talks to GrayMatter's VP of professional services and Sr. Member of the International Society of Automation (ISA) Committee, John Benitz as he explains the ISA 101 HMI Standard – a topic that garners a lot of interest from our audience. Jeremy sits down with Jim Alampi, a highly-sought after CEO coach, leadership team consultant, and business strategy advisor who's worked with thousands of top executives. 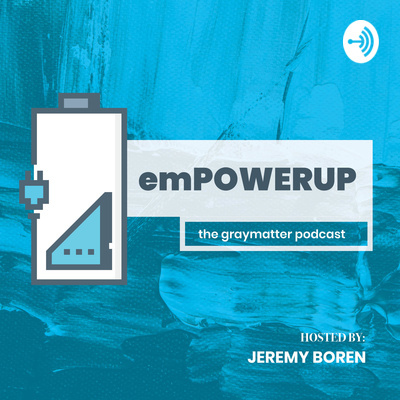 Welcome to the first season of emPOWERUP, GrayMatter's podcast. Jeremy Boren hosts interviews with our partners, employees, and customers with the goal to give insight into how companies like GrayMatter analyze huge amounts of data and ultimately improve the operations of industrial companies. But that's just one half of it. The other is all about empowering the people – and that's where this podcast gets its name. Episode 1 features GrayMatter long-time partner, executive consultant Jim Alampi on dialing into the right company culture before implementing the technology.